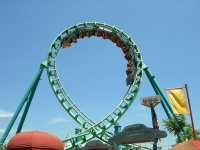 This popular amusement park is conveniently located in downtown Denver, offering about 50 rides and attractions for families in Denver. Rides range from the thrilling ten-storey Twister II roller coaster, to the pretty hand-carved carousel that dates back to 1925. The connected Island Kingdom Water Park offers relief on hot summer days, with around a dozen waterslides, raft rides, and family play areas. Entrance to the theme park includes entrance to the water park at no extra cost. Elitch Gardens Theme Park is seasonal, open between April and October and closed the rest of the year. Visitors should note that the park is open daily in the peak summer months but only sporadically in April, May, September and October; it is essential to check the calendar on the official website listed below before visiting to avoid disappointment. The E and C light rail lines stop near the entrance to the theme park. Opening times: Hours vary according to season.